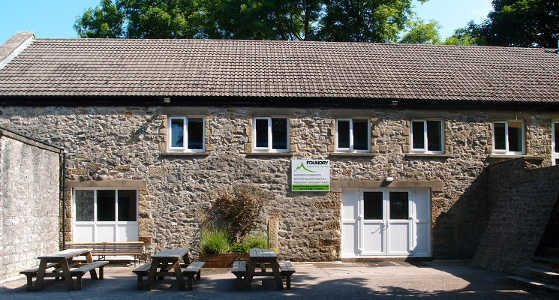 Foundry Adventure Centre provides group accommodation in The Peak District National Park. Choose 31 or 52 bed options, with camping for an additional 30. The comfortable bunkroom style centre is situated in the village of Great Hucklow, central to the national park and close to many of the area’s attractions. We welcome a wide variety of groups including families and friends, schools and educational, activity clubs and corporate. Our aim is to provide good basic bunkhouse accommodation where guests can enjoy and relax. The whole centre will be booked for your exclusive use. The accommodation includes a spacious lounge, library, wood burning stove, tv and wifi. The kitchen is fully equipped for group catering with a 2 large fridges, a chest freezer, 10 electric hobs, 2 large ovens and steel catering surfaces. The dining area is equipped for serving and seating 60. There are 4 male and 4 female showers, in private lockable cubicles plus an additional single shower and toilet if required. 9 bunkrooms totalling 52 beds are on the first floor. The building is situated in 2 acres of enclosed land with grass, trees and car parking. Please click on the gallery below for a tour of the facilities. Please click below to download a booking form that can be returned by email or post. We require a deposit of £200 per night that can be paid by cheque or bacs as per the details included. Full payment is required 2 months before your arrival date. Thanks, you guys were so helpful with the planning, we had a great weekend. Thanks, we have some fantastic memories. The centre was a superb base for our event, we would like to book again for next year.